There are many days these words are on repeat in my head. 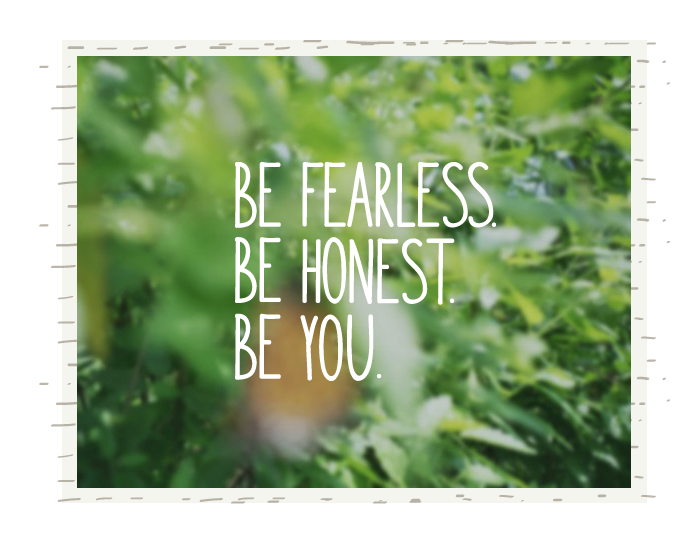 “Be fearless. Be honest. Be you” It is not always easy to be brave enough to take risks and be confident all at the same time. With Blog Brunch prepping for the March Brunch on Personal Projects I thought I would touch on the topic of it a little myself. When it comes to personal projects there can be a lot of fear of success, level of work load, and even how it may alter your current life for the better or worse. You may be comparing how other’s personal projects have gone and seen either their failures or successes and it has made you feel some lack of confidence in what you have been dreaming about. I feel this is right where I am at with my personal projects. For almost a year (I hate admiting that) I have been working to launch my Print Shop. There have been hiccups along the way and it has been placed on the back burner many times and when it is I hate it. It makes me build up frustration and guilt knowing I am not accomplishing something I want so badly. I get more projects that I cannot say no to because I love being a designer and once again I find myself just trying to keep my head above water with just the studio. I get wrapped up in the blog and working with the Blog Brunch team and before I know it another week has gone by and I have not gotten this personal project off the ground once again. Not that I regret or feel badly about the work I have done because I am just as passionate about the studio, the blog, and Blog Brunch as I am my print shop, but it is the disappointment I didn’t accomplish what I set to do. Some of it is time management, some of it is fear, and some of it is simply not being ready. I am working to get to a place where I can find a rhythm in life and I am hoping that will help with time management, goal setting, and some how balancing everything at once without feeling overwhelmed or at a stress level that is not healthy. I try hard to balance my time I work verse the time I play, but sometimes I think to get somehting off the ground and moving you have to give it more time and give up something for a period of time. I am trying to figure out what that looks like and how to balance that with the rest of life. It took a while to get over the fear of all doing a print shop. The thought of disappointing people always holds me back. I always want to give 100% to anything I do and I am realizing that 100% looks different for each thing. I struggled with the thought of receiving a complaint about a product and dealing with it. I wondered if people would receive something and think it wasn’t as cool as they thought and then I realized that all I can do is do the best I can, be nice, and honest and if it doesn’t work that is okay. At least I know I did it the best I could, I was the nicest I could be, and didn’t hide anything in the process. I find in life this is always the best approach more and more. So I hope this was helpful to any of you. I still have a lot to do and accomplish on this personal project but I cannot wait to finish it show you guys everything! It has been such a dream to me for so long…I need to just stop worrying about doing it perfectly. Kinks will always work themselves out. I would love to hear your tips and thoughts on this topic. I know I am not the only one thinking about personal projects so it would be great to hear from you all. Also make sure you tune into to Blog Brunch on March 3rd on twitter! We have some great people who are involved and everyone wants to help everyone else. It is so wonderful and encouraging! I’ve already added your etsy shop to my favorites! I’m sure your prints will be awesome. Aww thanks!!! I actually won a Big Cartel site and will be posting my things there. I received it when I was at Alt Summit. It was a crazy thing but it means a lot you already have me as a favorite!!! I love your taste and site; definitely a new favorite. I just found you through the Alt 2012 Attendees inboard. Your work is awesome! Can I ask who designed your site? I am looking to have mine designed with a new layout and would like a similar style. Thanks. Thanks so much Ali!!! Glad you found me 🙂 I am a designer and did all the design work on my own site. I partner with another developer to make the magic happen but shoot me an email you if you are interested! Would love to hear from you 🙂 I love your site by the way!! you are definitely not the only one that this happens to! i find that i have no problem meeting other’s deadlines, but when it comes to decisions and processes for my own projects i drag my feet mostly due to fear of not succeeding i think. but you are right, in the end everything eventually falls in to place. your work is wonderful, so i know that your print shop will be just as great!